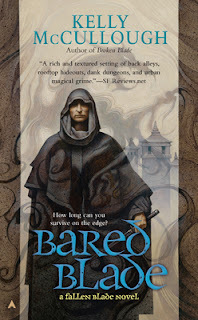 Bared Blade, the next book in Kelly McCullough’s ‘fallen blade’ series picks up where the last book left off, keeping Aral Kingslayer in jeopardy and trying to piece his life back together. As a former Kingslayer, Aral has turned to less honorable work as a shadow jack. He’s the guy that people in the underworld of Tien turn to when they need a problem to go away. Aral’s got a price on his head, and is still dealing with the loss of his Goddess, as well as other personal issues. In short, he’s barely scraping by in every possible way. Things may have gone on this way for awhile, but this is when trouble usually comes to one’s doorstep, and in Aral’s case, it’s two women in front of his ‘office’ - a local tavern. When Triss and Aral step in, they find themselves in the middle of possibly preventing a war, and a number of people are after them. All of this is on top of the other stuff that Aral has been dealing with, and the plot takes off. Over the course of the story, the author chooses to have Aral grow, instead of act impulsively as is the case for protagonists of this ilk. Slowly, but surely, Aral stops reacting, so much as planning his next move and figuring out how to survive. Since Aral has stopped following the commands of his goddess, he isn’t as sure of the path he should be taking, and this makes him very much a work in progress, which is an excellent way to get inside his head and care about his progress as a person. Triss, the dragon shadow familiar that is Aral’s partner takes on a larger role in this story, and this allows the reader to gain a greater understanding into the magic of this world. In addition, Triss is a lighter counterpoint to Aral, who sometimes slips into a depression. The choice of pairing them together is proved to be a wise one in this story. In ‘Bared Blade,’ there is more action than the previous book, and the author has a strong grasp of what works best for the characters. There are still some rough edges, and the book doesn’t stand completely on its own, but for anyone looking for a slightly different fantasty story, ‘Bared Blade’ is a good choice.